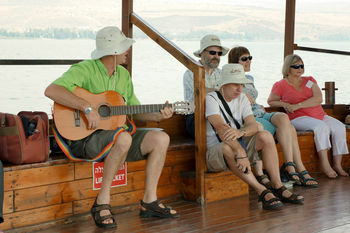 Singing on the Lake of Galilee (2012 Pilgrimage). Fulfil your dream and join Rev Mike Hawke next year in Israel as you follow the footsteps of Jesus for a special pilgrimage. We stay in the Old City of Jerusalem which enables us to get up early and explore the place in the quiet. We head north to Galilee and enjoy the tranquil waters, and then to Cana where Jesus turned water into wine. We walk up the Mount of Beatitudes where Jesus preached his sermon and lots more. Travel dates are 19th May 2014 to 3rd June 2014. More information about this tour can be obtained from Innovative Travel on email or by contacting Mike direct on 021 711 726.